Costs: Early bird rate for bookings before 17/3/16 £30 or after £40 for the day, £30 cons: low income/full time student, or £20 for the morning session only. I am very pleased to be co-teaching with Oxford’s resident AcroYoga teacher, Erin O’Halloran. Together we will be running a day long intensive into the solar side of AcroYoga. The day will split into to two sections with a 30 minute break in between. In the morning from 10am – 12.30pm we will explore inversions, introduce you to partner balancing & trio pyramids. This is suitable for complete beginners and a great opportunity to delve into the world being upside down and the art of collaboration & mutually finding points of balance. In the afternoon from 1-3.30pm we will work focus on the L basing acro transitions, some experience of AcroYoga would will help you get the most out of your day, though its not essential. We will cover washing machines, acrobatic sequences that can be repeat again and again and we will also touch on the elements of hand to hand connections. 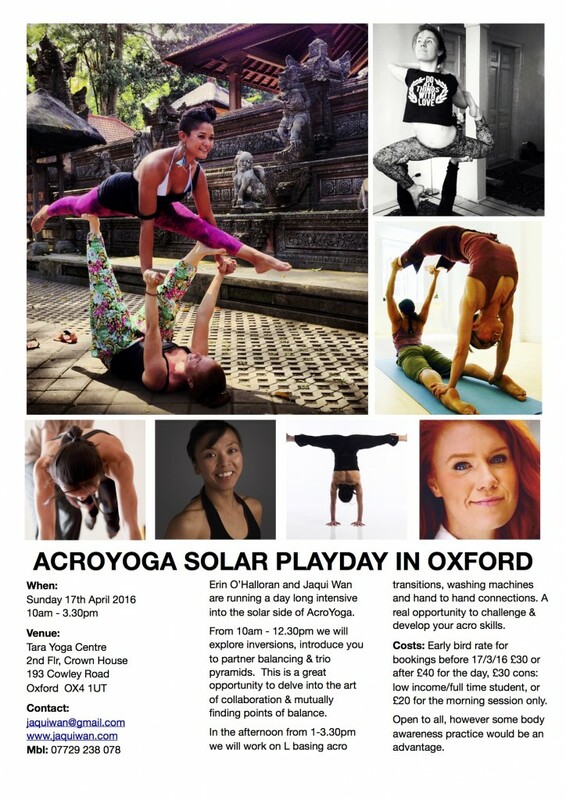 This will be a real opportunity to challenge & develop your acro skills. This day is open to all, however you are a complete beginner you are most welcome to the morning session only or if you want to challenge yourself do the whole day. Please some body awareness practice would be an advantage. For payment please use the Pay Pal link below. If you do not have an account please email me jaquiwan@gmail.com and will send you the BACs details to do a transfer.